Dons may be in an even better position in League 1 on Saturday night, even though they aren’t playing this weekend, and may find themselves outside the play-off spots. 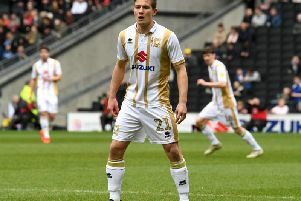 Dons are without a game this weekend after international call-ups for Will Grigg, Ben Reeves and Dele Alli forced their away match with Scunthorpe into postponement. As it stands, Dons are fourth in the league, with two games in hand, nine points adrift of runaway leaders Bristol City. But they could slip out of the play-off spots on Saturday, falling three games back in the process. But remaining in the pack, keeping their games in hand for now, Robinson believes Dons will be the team to fear in the next few months. “We are the team to watch this year,” said Robinson. “We’re the team everyone has their eye on. We were tipped to be in the bottom half of the table by everyone. “I think we’re still under the radar to some, and not playing these games keeps us there. “If we had those extra two games, and maybe another four points, we’d be in a better position and we’d be there to be shot at. “But while we’re in the pack, not many people notice our results. “We’re a third of the way through the season, but the next third will be harder. We have to keep believing. “The group is in a very good position.